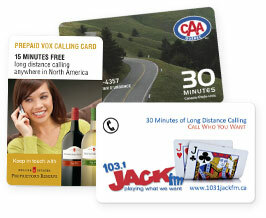 Custom-designed with your brand's logos, colours and visual identity, Vox promotional calling cards are a highly cost-effective and creative way to market your organization, cause or event. Your target audience will be happy to receive and use these practical cards, making them powerful tools for your brand awareness, customer loyalty or fundraising campaigns. and any other initiative to help people remember you. Full VOX support and service, including free 1-800 access, bilingual Canadian customer service and quality connections. We can even build in a customer survey to find out what's on your target audience's mind. Our team is standing by to answer your questions—drop us a line today at prepaidpromo@VOX.ca to discuss your needs!